The board of directors of Camp Rising Sun recently voted to sell its Red Hook and Clinton campuses and move the camp operations to an undisclosed location in Pennsylvania. The boys’ camp, located on 176 acres in Red Hook, has operated at the location since its founding in 1930. Camp alumni, of which there are over 5,000 internationally, are working an online petition to stop the move. The board of the Louis August Jonas Foundation, that operates the camps, announced on October 3 its intention to sell the Red Hook and Clinton (girls’ camp) campuses and to move the operations to one location in a state “with lower operating costs” than New York to decrease expenses and ensure the camps’ long term viability. The board’s statement, issued on October 3, 2014, said, “A purchase of a newer and more modernized facility will eliminate our need to invest $4-5 million in such capital projects” that are needed at its current locations. The petition seeks to have the board “reconsider its planned actions and to communicate that alumni were not given ample warning or opportunity to influence this decision.” It continues, “A large number of Rising Sun supporters around the world have expressed their concern that the decision to sell the properties has been taken in undue haste, that the expected price in today’s market is too low, and that other avenues exist to solve the financial challenges that LAJF faces in the wake of the 2008 crisis and escalating costs (e.g., fund raising, cost reduction). In an effort to grow the impact of the organization, the board has in recent years authorized an unsustainably large percentage of spending from the Endowment. Much of this has gone to support an ever-larger percentage of overhead, which now stands at nearly 50 percent of annual expenditures. We believe such practice, however well-intended, lacks the fiduciary prudence needed by a charity that seeks our support. We do not believe that moving will solve the spending problem; and we believe that the board should focus on preservation of the camp’s mission and organizational survival at this time.” Alumni campers question the reasonableness of an organization for 120 campers that has seven full time staff members, an executive director that is paid approximately $200,000 and lives in California, and an office on Madison Avenue in Manhattan. Another reason to sell the properties often cited by the board is the camp’s location on Oriole Mills Road, that goes through the campus to the Aerodrome. The board has suggested that local officials won’t find a way to slow down traffic on Oriole Mills Road in the summer and that it’s too dangerous. But in 85 years no one has gotten hurt. The online and written uproar by camp alumni about the decision to sell the properties seems to have taken the board by surprise. On October 20, the LAJF president and executive director issued an updated action plan that read, “We appreciate all the feedback that we’ve received from alumni. We want to thank those who have vocalized strong support for the recent decision, as well as those who have expressed their concerns and shared their personal stories. After listening to the suggestions, the board is taking the following measures to embrace our renewed alumni vigor for CRS,” and that the sale of the Red Hook property would be put on hold for six months, while expenses would be reduced and fundraising efforts would be reinvigorated. According to local real estate professionals the property has not yet been listed for sale. Camp Rising Sun is an invitation-only, international, full-scholarship, leadership summer program for students aged 14-16. There is a boys’ facility in Red Hook and a separate girls’ facility in Clinton. Participants come from all over the world and are chosen by merit. Instead of being asked to pay for tuition, campers are requested to pass along to someone else the benefits they gained. The son of a successful businessman, Jonas grew up in privilege and wealth, but was troubled about the advantages he had in comparison to others. He grew dismayed at the world. Pondering what he could do to bring a measure of stability and peace to the world, he reasoned that hope rested in the youth of the world and he began to consider what might encourage, stimulate and motivate them. He got the idea to start a camp, one that “is interested not merely in the boy, but in the man the boy will become.” He set up a foundation, naming it after his father; the foundation runs the camp. For decades, Jonas personally interviewed many prospective campers and he was fondly called by all by his nickname, “Freddie.” Jonas remained closely associated with the program until the time of his death in 1978. There are alumni organizations in numerous countries with more than 5,000 alumni around the world. Camp Rising Sun alumni include a United Nations Under-Secretary General, a president of Harvard University, a winner of the Intel Science Talent Search, a Foreign Minister of South Korea, two former Israeli ambassadors, an Under Secretary of State in the Carter administration and folk singer Pete Seeger. 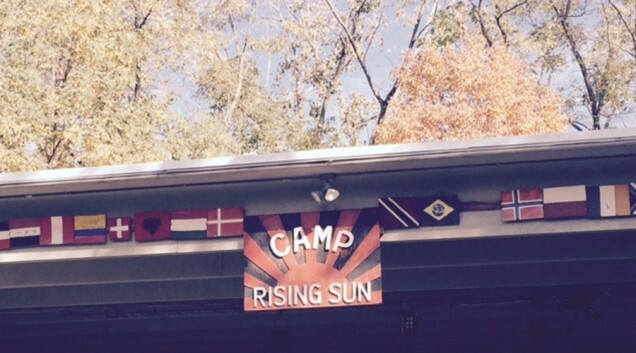 Correction: The story about Camp Rising Sun in the October 22, 2014 edition of the Hudson Valley News mistakenly reported that the foundation had seven full time employees in New York. It was pointed out to us that of the five full time employees in New York, as stated on their website, the two employees who live in California and D.C. were included in this headcount. We apologize for the mistake. Originally published by Hudson Valley News on October 22, 2014. Reprinted with permission.